The SimpleTelly Region Selector allows you to set your preferences on a per-service basis. So for example, you might set your Amazon Prime region to UK, whilst still watching HBO from the USA. Some of the channels that we support clash with each other and when this occurs, you can only make one selection. Fortunately, it does not affect that many services. Where we have a clash of services, we have split them up into Option Groups and you are limited to one selection from each, however, you can change your selection as often as you want to suite your viewing requirements. As all of these channels use the same internet service, we can only set it to one country at a time, so you must choose between then and set the Active Region accordingly. 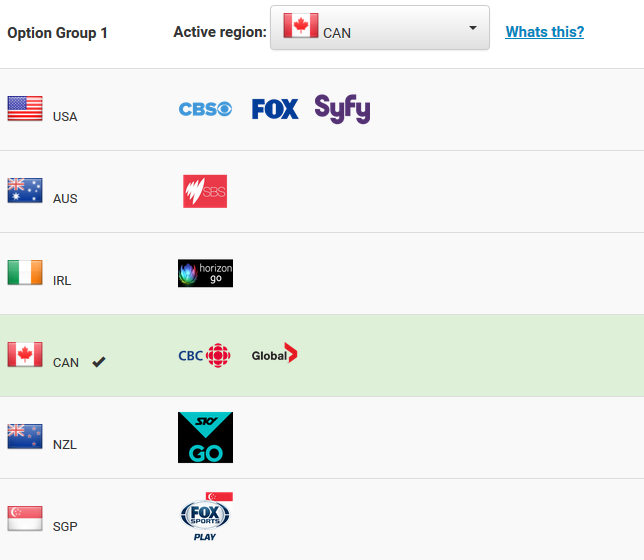 If you wanted to watch FOX, you would have to set the option to USA and this would mean you would not be able to watch the other channels in the option group. I hope this has given you a better understanding of the region selector, if you would like any further assistance, please send us an email to support@simpletelly.com and we will do our best to assist you.